As the year turns to autumn, October has increasingly become a focus for encouraging people to follow through on their resolutions to quit smoking and/or drinking alcohol. 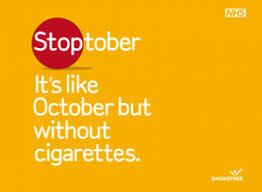 Public Health England’s (PHE) annual Stoptober campaign provides a welcome boost in terms of public awareness. Mass media encouragement to quit smoking is definitely a welcome feature in the autumn landscape, and Stoptober messages cross the border into Scotland, raising expectations here. This year’s Stoptober features prominent encouragement to try e-cigarettes, with PHE entering into partnership with the Independent British Vape Trade Association (IBVTA) to direct would-be quitters to local retailers and possible discounts on purchases. I do have some concerns about PHE’s driving focus on e-cigarettes. They have a place, but no one quit method works for everyone. Evidence so far suggests that e-cigarettes are less harmful than tobacco, but to gain any benefit you have to quit smoking completely. There is still a lot we do not know about e-cigarettes, and the term covers a fast changing range of products and different ways of using them. While commercial nicotine providers are keen to position themselves as stakeholders in public health policy debates, their arguments focus on commercial solutions. In Scotland, the ‘Quit your Way’ approach has the potential to spark a wider, more open conversation that explores what routes an individual smoker might choose to quit tobacco, and to stay quit. Public health interests take in wider population level effects, and must take account of the Scottish and international evidence independently associating youth e-cigarette use with smoking. In the foreseeable future Scotland will debate regulations to limit domestic advertising of e-cigarettes, such as billboards and sponsorship. I trust we will frame this debate with the aims of both reducing tobacco use, and building a generation free from tobacco. The spectrum of harm reduction should not end at commercial nicotine delivery options, and any changes to e-cigarette regulation must be aimed both at helping smokers to quit and at preventing young people from starting on either e-cigarettes or tobacco.